NFL fans everywhere will want to eat these crispy, flavorful, can’t-eat-just-one wings! 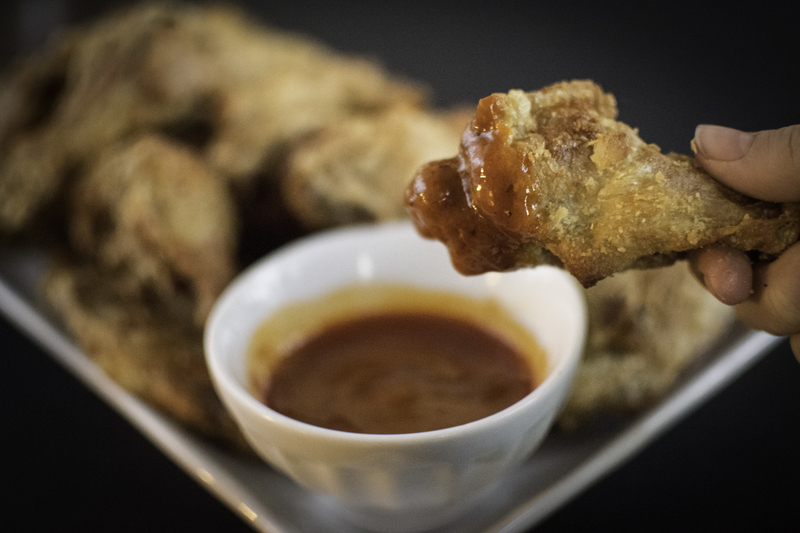 These baked wings are just as crispy as fried wings, and we serve a buttery-spicy-tangy sauce for dipping on the side. Be sure to use the amounts shown in the recipe – resist the temptation to add more baking powder and salt! Place chicken on a wire rack or on a paper-towel lined plate and let it dry out for a few hours, or overnight. Preheat oven 250 degrees Fahrenheit. Place 1 teaspoon salt and baking powder in a plastic bag, and shake to combine. Add the chicken, and toss to coat. It will be a very thin coat - resist the urge to add more baking powder or salt! Place coated chicken on a wired rack sprayed with oil and placed on a foiled baking tray. Place in oven for 30 minutes to let the fat melt away, then increase the heat to 425 degrees so the chicken can become crisp. Let it cook for 40-50 minutes. Meanwhile, combine all Buffalo sauce ingredients in a sauce pan over medium heat. Let the butter melt, and combine thoroughly. Serve the sauce on the side of the chicken, and enjoy!